How to Clean Blood Stains From a Mattress? Everyone that blood stains on the mattress make the entire mattress look ugly and everyone wants to clean it as simple as possible. Since blood stains are the protein stains it takes little more effort to clean, unlike other stains. If you are thinking how to get rid of those ugly blood stains on the mattress then here are a few methods and techniques through which you can easily get rid of those blood stains in a simple and easy way. First of all, try to clean the blood stains as soon as possible. Remove Blood Stains Mattress as soon as it has occurred will really reduce your effort. Take a white cloth and then dip it in cold water. Make sure you make use of cold water only. 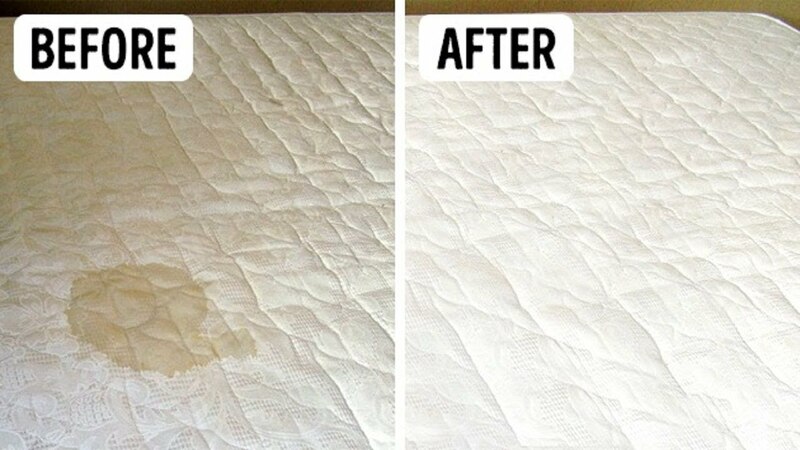 Using hot water can make the stains settle deep inside the mattress. So, it is always advisable to make use of cold water. After dipping the cloth in cold water, try to dab the cloth on the stains. Dab the stains slowly. Do not wipe or rub the stains as there of chances where the stains will spread. So try not rubbing them hard, just dab it slowly so that the stains will not spread. To get rid of those blood stains, you can easily make a cleaning solution with the materials available at your home. Take some salt, baking soda and then mix it well with water. Mix well and make a paste. Do not over pour over and make them a solution. It should be in the form of a thick paste so that you can easily dab it on the blood stains. Take a certain amount of paste and dab it on the blood stains. After applying and dabbing the paste on the stains, let it dry for about 30 minutes. Make sure you remove it completely using a soft and gentle brush. Do not over rub with the brush; it may damage the quality of the mattress. You can use a cloth dipped in cold water and then wipe the paste completely. Make sure you do not leave the mixture on the mattress. If you find it hard to remove the stains with the above-given tip, then you can use another method. All you need is hydrogen peroxide and dish soap. Mix two parts of hydrogen peroxide with one part of dish soap. Pour a small amount of the solution on the stains and let it dry for about 5 minutes. After 5 minutes wipe off the solution completely from the mattress. Do not over pour the solution on the mattress, hydrogen peroxide will discolor the mattress and reduce the quality of the mattress. Did you know that King size Mattress Cleaning could make our bed look new again? So do not replace your favorite Mattress let our expert restore the beauty and extend the life of your favorite Mattress. With our business grade Fresh Mattress cleaning system your Mattress other piece of furniture can look near new again. So do not go out and buy new Mattress Cleaning and do not be embarrassed by your Mattress. Using our techniques, we can assist make you feel good about your Mattress again. Keep your Mattress Green and give your Mattress a New Look! How will you “Green” clean your Mattress? Fresh Mattress Cleaning use Green techniques to house cleaning. Our skilled Mattress Cleaners can restore the beauty and increase the life of your Mattress and Fresh Mattress Cleaning Follows 4 Strategies to Achieve a Green or ‘Organic’ Solution in every type of Cleaning Services. Firstly, we will vacuum your Mattress Cleaning Melbourne using a powerful vacuum cleaner with a high-grade filter. It is surprising how much grime, dust and other allergy-causing contaminants can be removed from a Mattress in this way. Cheap ‘splash and dash’ Mattress cleaners almost always omit this vital first step. Secondly, Your Mattress will be sprayed beforehand using either a food grade phosphate or an eco-friendly colloidal solution. There will be no obnoxious chemical smells, optical brighteners, perfumes, hydrocarbon solvents or other chemical most horrible. Thirdly, The Mattress will be agitated using dissimilar techniques depending on the kind of furnishing and personal preference. This step loosens grime, grease, oil and other spots. Fourthly, The Mattress will be deep extract using very high-quality Mattress cleaning tools and you will discover that all of us have invested heavily in the latest tools. This step is sometimes called Mattress Steam Cleaning Melbourne. Clean The Mattress : 5 DIY Tricks To Do It Yourself. cleaning the mattress is something that may seem complicated, but with these five DIY tricks you can do it yourself like a pro. We are constantly cleaning our home, but we forget the Mattress Steam Cleaning Melbourne, which could cause all kinds of allergies due to the mites that after a while reproduce in it. Vacuuming the mattress will make your job easier and more effective. Depending on the type of stain or odor on your mattress, use one of these 5 bricolage tips to leave your mattress as new without having to pay a professional. Bicarbonate: Use a mild soap solution such as bricolage trick with the following measures: one tablespoon of soap powder for one liter of water and one tablespoon of baking soda spray it all over the mattress making circular movements with a sponge. Essential oils: Make a solution with half a litre of vodka and about ten drops of tea tree essential oil (although you can also use the one you like best) and spray your mattress on both sides with the mixture. This do-it-yourself trick is very effective because the vodka has such a high level of alcohol that it will eliminate the bacteria in the mattress, especially those with a bad smell, while the tree oil will leave a pleasant smell and the Mattress Stain Removal will be more noticeable. Oxygenated water: You can also use the oxygenated water to clean and disinfect the mattress yourself, you will need a cup or 250 ml of oxygenated water (which you can find in any pharmacy), two drops of liquid soap and four spoonfuls of baking soda, make a homogeneous mixture with the ingredients and pour it into a spray especially in the stains (here you can help you with a carpet brush), in the blood stains this trick is effective, let it dry in the sun and your mattress will be disinfected. Another trick you can do yourself is to implement vinegar. White vinegar removes stains of urine, sweat and drinks for this you will need ¼ cup of vinegar ½ cup of baking soda, sprinkle the baking soda on the entire mattress and then sprinkle the vinegar on top to make it effervesce. Leave it on for about ten minutes and stir with a cloth of warm water, leave it outdoors for a day to eliminate the smell of vinegar. The lemon is the king of the bricolaje and the deep cleaning, in this case we will mix it with a few drops of soap and warm water and we will spread it with the help of a cloth for all the mattress, rubbing of circular form. This removes vomit and urine stains as well as bad smells. At the end of the vacuuming process, you can also pass hot air through the dryer to remove any remaining bacteria and ensure excellent deep cleaning Mattress. At the point when a great many people consider sleeping pad cleaning it’s to either dispose of unattractive checks on it like sweat stains, blood or pee or to clean it for expelling dust parasites and for general cleanliness. Notwithstanding, this is an extremely authority process and watchful idea ought to be given to how this is done as a sleeping cushion is altogether different to a cover for which there are set up and compelling strategies for cleaning. The issue is that a sleeping cushion doesn’t dry well. Because of their creation and how thick they can be, dampness in a sleeping pad does not dry out effortlessly, as with a cover for instance. This implies customary cleaning forms utilized on floor coverings and upholstery ought to be maintained a strategic distance from no matter what. This will discount boiling water extraction and furthermore steam cleaning, even dry steam cleaning which still requires drying time and as the sleeping cushion sets aside such a protracted opportunity to dry this could support the development of form which is conceivably perilous to your wellbeing. Alright, so where does that abandon you with regards to sleeping cushion cleaning. Well most cleaning organizations will concur that with regards to recolor evacuation for imprints, for example, the ones said above are relatively difficult to expel, halfway in light of the fact that it would mean influencing the sleeping pad to sodden and incompletely on the grounds that what takes a shot at a cover does not really fill in also on a bedding and frequently when you endeavor to evacuate a check you will be left with ring when it dries. It would be significantly more sensitive to leave the stains and clean the sleeping cushion an alternate path, to eliminate germs and evacuate any tidy and allergens that have developed in the bedding. A sleeping pad defender can simply be put on the bed for stylish a great many. So how would you approach expelling dust vermin and all the tidy in there and cleanly clean it to eliminate germs without getting it moist? The best method for sleeping pad cleaning is to utilize a decent vacuum which has a HEPA framework on it. There is a, however. Most family unit vacuums aren’t generally sufficiently intense to do it legitimately, particularly on the off chance that you are worried about expelling dust vermin you have to get a pro sleeping pad cleaning organization to do it for you. They will utilize machines that have substantially more power and suction than your own so they will have the capacity to evacuate significantly cleaner and allergens then you could. Their machines may likewise have a germicidal light on them as well, which will have the special reward of eliminating germs and infections and denaturing allergens. Numerous will likewise complete the procedure by utilizing a protected plant-based splash which will be hostile to allergen/disinfecting shower. The final product will be a cleanly perfect, allergen-free and tidy free sleeping cushion that will be dry and prepared to utilize again inside minutes. The Mattress Cleaning Company should likewise clean the two sides of the bedding for you and leave the sleeping pad turned as well. Sleeping pad clearing completed each 6 to a year will radically help individuals with tidy vermin sensitivities, for example, skin inflammation, asthma and rhinitis, even individuals who wake up wheezing or with obstructed will feel an uncommon change and it could mean you could hold tight to your bedding longer and spare you cash over the long haul. As you know mattress play an important role in our daily life. When you need to rest then you go to bed but if your bedding should not be properly cleaned then you should not comfortable on that . So, Mattress needs to be cleaned once a year because when you sleep then you can sweat or there might be an accident while when you are sleeping. As we know that when we sleep each day and our mattress is getting dirtier each day. Then on that time you can use sheet but still it will not protect the mattress to get dirty and it resulted for bedbugs happens because we do not clean our mattress properly. A clean and comfortable mattress is essential for a good night’s sleep. While stains and dust mites are inevitable penalty of daily mattress use. So regular cleaning can help to minimise these discomforts. Vacuum your mattress on daily basis on once in a week from both sides. It helps to remove dust particles from it which can cause allergy and some harmful pollutants. Pre treat all the stains on the mattress. To break down the stain from mattress and make it easier to be cleaned out of the mattress fresh and clean uses organic non-toxic solutions. To remove the spots from mattress use enzyme cleaners which are effective to breakdown the overall strains and bring the shine on them. Although we don’t usually notice our own corporal smells, over time sweat can build up. To rid your mattress of rankness, sprinkle it well with baking soda and gently rub it in with a scrub brush, so it gets into the mattress giving fresh smell. As most of the cases kids enjoy bouncing on the bed, but the poor mattresses can’t bear the practice. Jumping on beds can damage mattresses and box springs and fracture your bed frames. Finally the cleaned mattress will be sanitized again with a chemical safe solution that will help delay the re-infestation of dust mites in the mattress. You can also contact us for more information as we are given best Mattress Cleaning Service in Melbourne.